Wow, that sure took some time. And doesn’t sound like something to try intentionally. Kudos to your research central anyways, this page is intense! When I passed out, it was more purple-grey and shaped like television static of old. Plus or minus a few geometric artifacts from me trying to think about how I couldn’t see actual shapes. It must be a little different for everyone, but the peripheral vision seems to go first. Huh. I get really bad tunnel vision when I stand sometimes. I have yet to pass out but a few times I’ve completely lost my vision. It’s when my hearing goes too or when my knees feel like they can’t support me anymore that I sit myself back down but that’s only happened a handful of times. Vision gets eaten away in weird shapes sometimes. Did it work or did you still have the hiccups when you woke up? I still had them XD Also I passed out while getting ready to brush my teeth in the bathroom, so I cut my lip open on the side of the mirror too, haha. Life hack: if you take ~20 tiny sips of water in a row, without stopping to breathe, it will always get rid of the hiccups. When my vision goes (and it goes OFTEN because I frequently experience orthostatic hypotension) it looks a little bit different, so I do think there are individual differences in perception. I see everything go dark with static, but there are also coloured stars in specific patterns overlaying it. You’ve been very productive lately, good stuff! I hope Mike’s gonna be alright, but also kinda that he’ll turn into an alien fish mutant. As I said under the last page, I’ll half-expect him to just look like a big ball of alien creatures before he gets back to the surface. On one hand, I hope it’s medical stuff sent to detach his parasites from him, on the other… without tightthing he’s gonna die. Especially if he doesn’t surface. o dang, is Mike getting hibernated? Is that where Kallakore went just now? Is he gonna wake up 100,000 years from now ._. That’s Mike’s POV as he blacks out due to the needlefish injuring (or killing) Thighfreind. Thighfreind has been acting as a gill, allowing Mike to survive underwater. With Thighfreind out of commission, he’s starting to drown. Think about what happens to your vision when you, say, get a bad head rush from standing up too fast after sitting down for too long. Looks pretty similar to that, right? 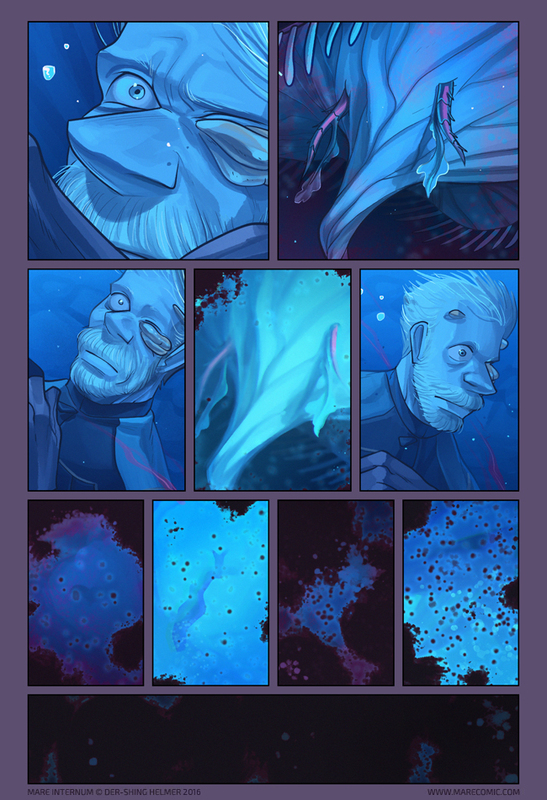 Are… those streams of blood in panels 3 and 5…? Good depiction of blacking out! I’m intrigued by the dark-light-dark-light pattern in panels 6-9–is Mike starting to go unconscious, then drifting back closer to consciousness again, then drifting toward unconsciousness again, etc? Or are panels 6 & 8 what he sees out of his left eye (and darker because it’s the one basically covered by fungi) and panels 7 & 9 what he sees out of his right eye? Haha, I was trying to have a heartbeat thing going, pupil dialating and contracting. Probably didn’t come across but I think people can tell he’s blacking out so it’s not super important. Ive often wondered: if I turn the lights out, let my pupils dilate, turn lights on and let pupils shrink, turn on & dilate, turn off & shrink… If I did that repeatedly, could I develop the burliest, most manly iris muscles in the world? WELP! That’s the comic folks! Hope you enjoyed it! His face is frozen, and his eyes are open so wide. Is that just shocked realization that he’s not getting oxygen any more, or did those stabfish inject a paralytic poison? The latter, I believe. An effective anti-intruder tactic/immune response. Kallecore looks like a Marvel superhero in panel 7.